Use the Newfoundland and Labrador child support calculator to determine the potential basic monthly payments that may need to be made in a family court action. 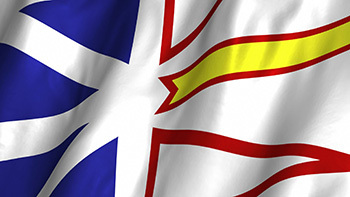 Newfoundland and Labrador adopted the Federal Child Support Guidelines through its Family Law Act, albeit with a few minor amendments that may vary the monthly amounts paid. It is imperative that residents of Newfoundland and Labrador be aware that certain courts in certain areas do not accept filings of documents related to child support matters. You must contact the local courts administration office in your area to determine where that information is to go, and where you might be able to obtain information about child support court matters. 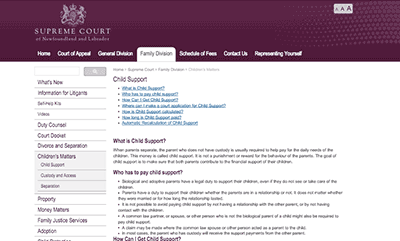 The Family Court section of the Newfoundland and Labrador Courts website has excellent informative resources for those involved in a Newfoundland and Labrador child support action. Readers should also visit the Newfoundland and Labrador Family Court website, where they will find significant amounts of user-friendly information. In fact, the Supreme Court Family Division section website has an entire section devoted exclusively to child support matters. Once you calculate your potential basic monthly payment amounts, you might want to visit that section of the Court website. Participants in Newfoundland and Labrador child support cases should be as well-informed as possible with as much public information before even heading to court or speaking to qualified counsel. For clarification on Newfoundland and Labrador child support guidelines, it is important that you contact a lawyer and/or the local courts administration office in your area. 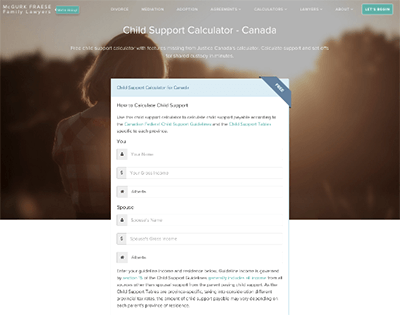 For more complex child support calculations with children living in both homes (shared custody), try this child support calculator. The Supreme Court website offers detailed information on child support claims in the province of Newfoundland and Labrador. How does one collect child support? 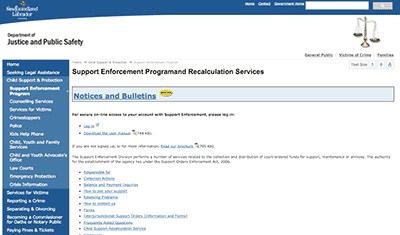 In Newfoundland & Labrador there is the Support Enforcement Program, a government agency offering assistance in enforcing support orders and collecting payments.